Doctors Scott and Lisa Gontarek invite you to submit your questions and partcipate in an online video Q&A. Gontarek Eye Care is excited to announce that it can now offer the latest in contact lens technology — the Acuvue Oasys 1 Day lens! These lenses are state-of-the-art and are designed to reduce symptoms of tired eyes and dryness while also providing enhanced comfort and performance. 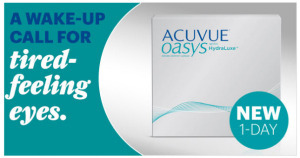 The new lenses are called “Acuvue Oasys 1-Day with Hydralux”. Our eye doctors feel these contact lenses will provide better performance throughout the demanding day, especially if you shift environments a lot. The lenses feature tear-infused technology, which provides an enhanced network of tear-like molecules that integrates with your own tear film each day to help reduce symptoms of tired eyes and dryness. • Daily Disposable: Lens solutions have been implicated in reduced lens performance and comfort. As a daily disposable lens, the Acuvue Oasys 1 Day requires no lens solution. We are very excited about this new contact lens technology and hope families in Virginia Beach, Chesapeake and Norfolk are too. In a study of 119 people who wore Acuvue Oasys 1-Day with Hydralux for a week and another well-known contact lens for a week, most people chose ACUVUE OASYS 1-Day with HydraLuxe. In fact, 8 out of 10 people reported they maintained the feeling of good eye moisture, and rarely experience eye fatigue. For more details about these lenses please click there for a short video. If you are ready to experience all-day comfort and consistency with your contact lenses, please contact us at (757) 966-2206. Dr. Scott E. Gontarek and Dr. Lisa V. Gontarek invite you to view their Welcome Video above. Since 2010, our eye doctors have provided families in Virginia Beach, Norfolk and Chesapeake with the best eye care possible. Our eye clinic is rooted in the philosophy of good old fashioned honesty and customer service – and our patients appreciate that. Our eye doctors and staff provide everything from state-of-the-art contact lenses to co-managing surgical patients. Our practice dares to be different. In today's fast paced society, we strive to hold on to good old fashioned honesty and customer service. We realize that people have a multitude of options when it comes to vision care. Most everyone wants it now and wants it without complication. Our goal is to be the place that people come for eye care because they know that they are receiving top quality care in a family oriented environment. We want to be your neighborhood eye doctors.